Following a decision to centralise Darwin’s sporting facilities at Marrara rather than upgrade existing facilities across the city, Government needed to decide the extent of the development. 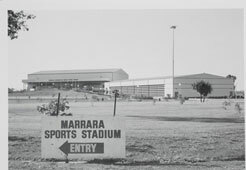 A sum of $2.5 million had already been allocated for the Marrara complex in 1984/85 to commence the development of outdoor facilities including a cricket field, wickets, amenities block, football ovals, synthetic hockey field and associated amenities, and a grassed field for hockey, soccer and athletics. The submission sought additional funding to complete the facilities to a standard required for the staging of national and international competitions in the Northern Territory, to be completed in time for Australia’s Bicentenary in 1988. In support of the proposal, the submission noted the hosting of major sporting events makes a substantial contribution to the promotion of the Territory, supports tourism and provides spin-off benefits to the business community. Cabinet approved two Capital Works projects at the Marrara Sporting Complex in Darwin as recommended in the submission. The first of these, for the financial year 1985-86, was the construction of a grandstand in the main football stadium together with grassing and irrigation of the No. 2 oval at a total cost of $6.57 million. The second project was the construction in 1986-87 of a cricket clubhouse and scoreboard, along with car parks, landscaping and spectator terracing, at a cost of $2.6 million. Read the Cabinet decision - submission number 3479 and decision number 4046 or 19 April 1985 (5.0 mb).